UPDATE: Humble pie. I already had to fix a pretty critical bug. Post Haste 1.0.1 has just been released. One of the more tedious tasks in post, with the exception of rotoscoping, is just setting up a project. A while back, we discovered the usefulness using a template folder to keep everything consistent. Thomas Tomchak at Suite Take goes into great detail about project templates. But we were still duplicating folders, copying and pasting, and renaming multiple files before we could get started. I decided to make the write my own software to make things easier. The result is Post Haste. Post Haste really just does one thing, but does it well: automatically generates a project folder for you. All you have to do is enter information such as project number, client, etc. and Post Haste will create a project folder with files in place and renamed. It’s customizable to allow up to five fields of information and auto-fills certain fields such as date, editor, or suite. Take a look. Post Haste is completely free. There are no nag dialogues about how you should give me money. Really, I wrote the program for myself to make things easier. But to make things interesting, I’m releasing Post Haste as “luchware.” If you find it useful, consider buying me lunch. Many people complain that some software is too expensive. I think it comes down to a fundamental difference in how software is viewed. I believe (most) software is a tool. I think others view (all) software as entertainment. Most software is an incredibly good deal, especially the applications that you use every day or as part of your business. For example, given that I make all of my living by using TextMate, and it was developed entirely by Allan Odgaard over (probably) thousands of hours, it would be ridiculous for me to haggle its €39 price. Now, this may sound elitist, but professional software is priced for professionals who make a living using that product. Final Cut Studio & Adobe Production Bundle (as examples) are priced acceptably, as I can make that money back rather quickly on the jobs I take on. If you just want to use Photoshop to touch up some family photos, make LOL Cats, or doodle, there are countless other options for you (Photoshop Elements, GIMP, Acorn, Pixelmator, etc.). Several hundred (or thousand) dollars for software which professionals can easily make back using said software is not unreasonable. Do you want me to price out a full Avid suite for you? If you view software as nothing more than entertainment, you probably would expect to pay no more than $50 for anything. It is a point-of-view I can fully understand; however, you then should not be looking at professional software, and you definitely should not complain about its price-points. However, while I don’t want to rain on anyone’s parade, I’m pretty sure this isn’t quite possible. I doubt the iPhone hardware is capable of crunching HD video. 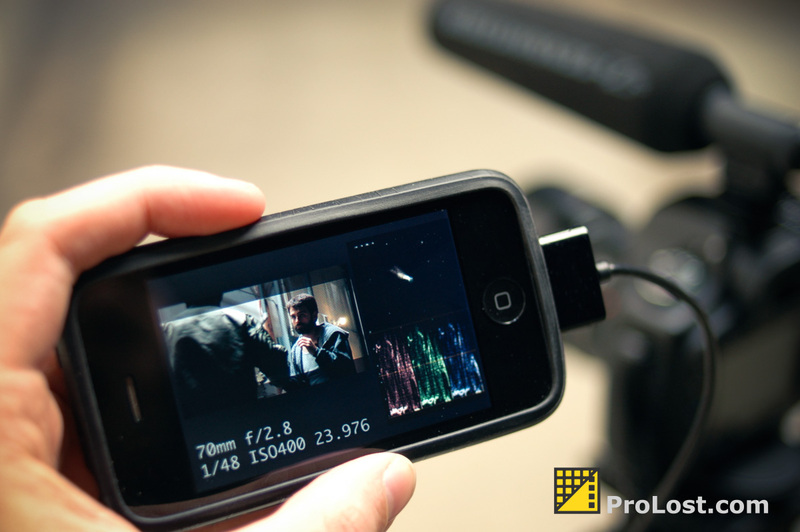 But perhaps that hardware accessory itself could crunch the video down to iPod friendly 480×360 h.264 video on the fly? With the ability for the on-screen controls to send commands to the accessory to show pixel-pixel video (with paning, of course) for a focus aide? Actually, hot damn! That does sound like an awesome idea!